The enduring relevance of a screened author. How to read a film like Manto along the grain of a genre which is as popular in the West as it is unpopular in Bollywood? The writer-biopic is an established genre in Hollywood and British cinema which reconstructs the lifetime of an author by dramatizing aspects of their creative, commercial and personal life. Since a few reviews of Manto complained about the film being an incomplete account of the writer's life, I wondered why it still worked so well for me. 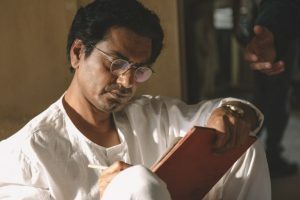 Manto felt like a breath of fresh air in the genre as it overcame the historiographic excesses of a period piece and appropriated elements of the writer-biopic to articulate a palpable relevance. As the film unfolded, it became more and more explicit about its interest in what Manto continues to signify rather than who Manto was. The title of this article alludes to a poignant question once raised by Michel Foucault: What is an author? His insistence on ‘what’ as opposed to ‘who’ ought to intrigue the uninitiated reader. Foucault’s analysis of the author as a ‘function of discourse’ explored the constructed nature of literary authorship. He argued that the ‘function’ of the author’s proper name is to point not to the person but to a specific set of ideas and practices (‘discourse’) which are historically constructed by critics, publishers and readers who rationalise and order his/her oeuvre over a period of time. Foucault’s observations remain just as relevant when we move across to the medium of cinema which has contributed a great deal to the construction of authorships, literary as well as non-literary. There have been countless films in Hollywood about real and imagined novelists, poets, playwrights, screenwriters, ghostwriters and so on. Whether it’s the Bard himself (Shakespeare in Love), a miserable hack (Barton Fink), an object of obsession (Misery), a poet charged with obscenity (Howl), the prolific blacklisted writer (Trumbo), the alcoholic (The Lost Weekend), a neurotic screenwriter (Adaptation) or the worker-poet (Paterson), a wide range of writerly representations have found their way into enduring cinematic images. Judith Buchanan’s research on ‘the writer on film’ and Kamilla Elliott’s study of ‘screened writers’ throw ample light on how Hollywood and British films have been obsessed with representing canonical writers on screen from the earliest years of cinema. Hindi cinema, on the other hand, is not particularly well known for films about writers. In the 1950s, Bombay cinema boasted the production of Sohrab Modi’s Mirza Ghalib and Guru Dutt’s Pyaasa which explored the emotional terrains of authorship through history and melodrama respectively. Closer to our times, however, we can only think of banal writerly representations in films such as Baghban and Shabd where Amitabh Bachchan and Sanjay Dutt respectively play Booker-winning novelists under rather irrelevant circumstances. Neither the two novelist brothers in Kapoor and Sons nor the poetess played by Aishwarya Rai Bachchan in ADHM are truly convincing as writers. Of late, only Professor Siras’ portrayal in Aligarh intertwined the sensitivity of his poetry with his unwillingness to be straitjacketed within the existing vocabularies of gender and love. However, Manto, much like Pablo Larrain’s Neruda, is quite an extraordinary attempt at representing an author’s life by incorporating postmodernist narrative techniques and eschewing generic elements of the writer-biopic. Conventionally, the writing process has been represented in Hollywood and British films as a tumultuous inner struggle where we see a writer (think of Helena Bonham Carter in Enid) frantically typing after a brief period of unproductivity, often sitting next to a window overlooking a world which inspires her. Whether it’s a writing desk and a typewriter or a quill and an ink pot, most Hollywood and British films about writers generally represent the writing process through a set of aestheticized objects which make up for what may not otherwise be as visually engaging. Manto, in the eponymous film, does not dramatically overcome a writer’s block to emerge prolific on the typewriter one inspired afternoon. In fact, he is not lacking in inspiration at all. However, among other personal and professional obstacles, he first struggles to come to terms with the formulaic demands of the film industry, and then the rules of the literary field. If the studio owner, Ardeshir Irani (played by Rishi Kapoor), does not pay Manto his dues, the Progressive poet, Faiz Ahmad Faiz, too publicly disregards his work as inferior literature even when he considers it to not be obscene. This is not a minor contradiction in the film that should be sidestepped. Pierre Bourdieu’s Rules of Art is a fascinating sociological study of how the literary field in mid-nineteenth century France was created through an outright rejection of the commerce of literature. Literature emerged as an autonomous field of cultural production which depended neither on patronage nor mass market, while other forms of profit-oriented writing became culturally inferior. In his memoirs, Manto himself is extremely disparaging of his screenwriting work in Bombay cinema during the 1940s, often reducing himself to a munshi (an Urdu hack) in order to propel himself into the literary canon. When Manto admits later in the film that he would rather have Faiz declare his work as obscene than inferior, the film again reminds us of how consciously the literary field is constructed. Much like the notion of the author, literature is also a constructed category of writing which celebrates a handful of genres, forms and figures, often at the expense of numerous others. 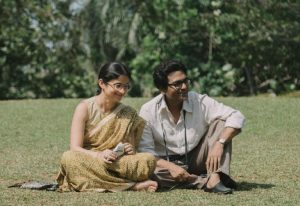 With this awareness of the arbitrariness of the category of literature, the film manages to overcome authorial stereotypes of genius and greatness, and humanizes Manto through his constant self-aggrandizement as well as his neglectful attitude towards his family (a sensitive issue dealt most deftly through the nuanced performance of Rasika Dugal). The filmic narrative blends fact with fiction by situating Manto within the fictional spaces of his famed characters. None of his stories are indulgent flights of fancy spiralling out of an inspired typewriter. They are, in fact, pencil notes about his immediate reality which tragically become a rich source of tales of unprecedented barbarity in the wake of Partition. Manto introduces into ‘literature’ the language and imagery of these times in all its nihilistic crudeness, distancing his works from the optimistic socialist strain of the Progressive Writers. Biopics aggregate and approximate lives. Ultimately, Manto is an immensely relevant tale of intolerance and censorship where the author is undidactically reduced to the enduring lessons of his life and works. Personally, as a student of film history, I would have loved to see more of Manto’s Bombay years. From the fictional Sarita of Dus Rupay crooning to ‘Main ban ke chidiya’ to the subtle representation of a demure young Nargis standing next to Jaddanbai, her mother and mentor, the film’s first half, set mostly in the tinsel town of Bombay, is an absolute historical treat. 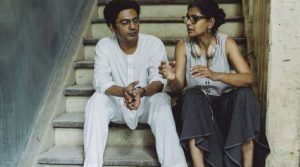 However, it is in the second half of the film that writer-director Nandita Das manages to transcend the generic constraints of the writer-biopic. Through his failure to publish and secure literary prestige, Manto no longer remains an armchair writer producing literature which tries to mirror the society. His obscenity trial is as much a symptom of the moral corruption of nationalism as the violence and trauma endured by his fictional characters. The film’s final words – “Saadat Hasan died at 42. Manto lives on.” – make an important Foucauldian distinction between the proper name and the author-function. Manto, the author, is a function of a social discourse we must revive in our times. His filmic representation only scratches the surface of his life and times because even as a historical film, Manto endeavours to offer more to the contemporary. These are ironic times when we are required to stand up for the national anthem before the screening of a biopic of a man whose life was fractured by nationalisms. There is still time though as the closing credits remind us. Bol, ke lab azaad hain tere! Rakesh Sengupta is a doctoral student in SOAS. His PhD research is on screenwriting practices in early Bombay cinema.